In 2009, we witnessed the "Revenge of the Fallen." In 2011, we were in the "Dark of the Moon." And in 2014, we'll be sent to the "Age of Extinction" as the title of the fourth big-screen "Transformers" adventure has been unveiled exclusively here on Yahoo Movies. 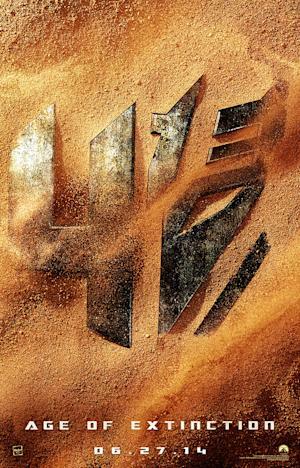 The title reveal comes courtesy of the first official teaser poster, which incorporates the now-familiar logo of the number "4" merged with half of a Decepticon insignia. The artwork suggests we're somewhere in the desert (or perhaps some post-apocalyptic wasteland? ), and the term "Age of Extinction" makes us think that one of our all-time favorite Transformers factions will be heavily featured in the movie. We're speaking, of course, of the Dinobots, the robots that turned into dinosaurs that were one of Hasbro's masterstrokes in the seemingly never-ending sub-groups of Autobots and Decepticons. The Dinobots were about the coolest Transformers you could own back in the mid-'80s, with the team consisting of leader Grimlock (a T. Rex), Sludge (a Brontosaurus) and Slag (a Triceratops), with Snarl (a Stegosaurus) and Swoop (a Pterodactyl) introduced later. "I can not disclose the specifics, but you can be sure that the arrival of the Dinobots will give the audience a lot to be excited about," said di Bonaventura, via Tformers.com. "The world's coolest, most exciting cars will appear in the film, including Chinese vehicles, so whether you are a car enthusiast or not, it will be a feast for the eyes." An interesting addendum there, as Hollywood blockbusters are all about catering to Chinese audiences lately. And they should be: "Pacific Rim" qualifies as a hit thanks to its astonishing $100 million take at the Chinese box office (more than that particular giant robot movie made in the U.S.). The new "Transformers" is being filmed in both in the U.S. and China, with Chinese singer/actor Han Geng making his English-language debut in the film. Beyond this, plot details on "Transformers: Age of Extinction" are being kept under wraps. We do know the lead this time will be played by Mark Wahlberg, who takes over the reins from Shia LaBeouf. Wahlberg reteams with his "Pain & Gain" director Michael Bay, who told Yahoo Movies that Wahlberg plays a father in the new installment. The cast of "Transformers: Age of Extinction" also includes Stanley Tucci, Kelsey Grammer, Nicola Peltz, Sophia Myles and T.J. Miller. The film will roll out (yeah, we almost made it to the end without including that reference) on June 27, 2014.